In 1925, local fisherman Joseph Blanchard hired local house builder Thatcher Johnson to construct this house on Fitzhugh Avenue for he and his wife Minnie. The 4-room, wood frame bungalow featured a metal roof, wide pine flooring and a front porch. Thatcher Johnson’s signature architectural detail is the diamond shaped attic vent over the front porch roof. Joseph Blanchard lived in this house for 24 years before he passed away in it on Christmas Eve 1949. He was 86 years old. Minnie lived for here for 13 more years after her husband’s death. She became ill and was taken to New Orleans to be closer to her daughters. She passed away there on August 30, 1963. Following her death the house had various renters and finally sat empty and deteriorated for several years. In 1997, Bernice A. Russell purchased the house at a tax sale. She dreamed of establishing a museum of local African American history. She chose this house because of its age, condition and she was a friend of the Blanchard family. Bernice passed away on November 12, 1999 before she was able to establish a museum. In 2001, the house was donated by Martha R. Bireda, daughter of Bernice, to the Bernice A. Russell Center, later renamed the Bernice A. Russell Community Development Corporation. On May 20, 2002, the house was moved from its Fitzhugh Avenue location to 1/3 of a mile away at its present site on Martin Luther King Jr. Blvd. The plot of land the house now sits on once was that of the El Palmetto Cigar Company and then later the Gollman Bar and Grill. On May 20, 2004, after the move and following months of renovations, the museum had its grand opening and celebrated Emancipation Day. Then on Friday, August 13, Hurricane Charley forced its way into Punta Gorda as a strong category 4 with sustained winds of over 100 miles per hour. The newly opened museum was damaged and had to be closed for repairs. 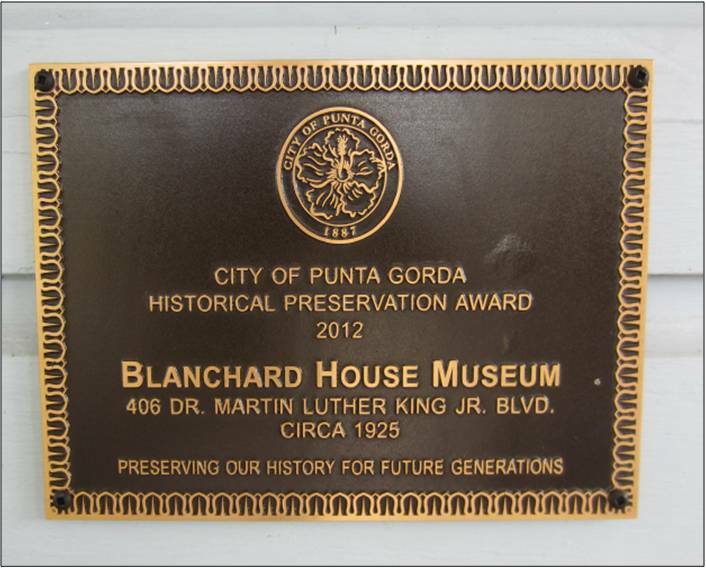 The Blanchard House Museum was finally reopened on February 4, 2006.